Founder and Board Chair Belle Linda Halpern co-founded The Ariel Group and co-authored the book Leadership Presence: Dramatic Techniques to Reach Out, Motivate, and Inspire published by Penguin/Putnam. Belle has been featured in the New York Times, Fast Company, the Boston Globe and on CNBC. 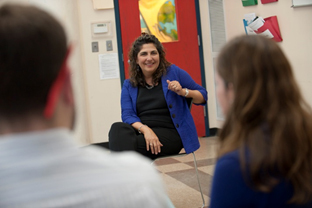 In the education world, she has developed and delivered leadership programs for clients such as Boston Public Schools, Teach For America, Achievement First, and Uncommon Schools. With The Ariel Group, Belle designed, delivered and led programs for executives and students from Harvard Business School, Columbia Business School and Duke over 20 years. The Ariel Group also has a 20 year record of success delivering leadership development in large organizations like American Express, Boston Consulting Group and General Electric. Belle has delivered keynote speeches at conferences for The Center for Creative Leadership, Excellence in Government, Linkage Women in Leadership Summit and Microsoft. A Harvard University graduate, Belle is also a professional singer who performs around the world and lives outside Boston with her husband, Mitch, and their two children. Her passion for closing the achievement gap started as a child when her parents founded a mixed income Montessori school in Newark, New Jersey.